"An artist of great brilliance and originality, Georges de La Tour was from the duchy of Lorraine in northeastern France. Early in his career he gained knowledge of contemporary Caravaggesque painting with its emphasis on realism and dramatic effects of light and dark. 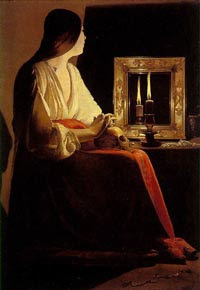 This picture shows Mary Magdalen in a dark room at the dramatic moment of her conversion, her features lit by a candle flame that imparts a hauntingly spiritual quality to the work. The elaborate silver mirror, the pearls on the table, and the jewels on the floor symbolize luxury, which she has cast aside. In their place she clasps a skull, a common symbol of mortality." The Penitent Magdalen first caught my eye while reading Museum ABC (L is for LIGHT) when Levi was just a year old. Something about it caught my attention. Believe it or not, it wasn't the skull on her lap as I didn't notice that right away. The painting was etched in my memory. Museum ABC features paintings on display at the Metropolitan Museum of Art, so imagine my surprise when we came upon this painting suddenly while visiting the Louvre museum in Paris just months later. I stopped short and gazed up at it. Considering the sheer volume of art housed at the Louvre (much of which we missed), it is amazing that I had the priviledge of seeing this masterpiece. While seeing this painting at the Louve was a surprise, it didn't match my astonishment less than a year later when I was watching The Little Mermaid. Ariel was singing the song 'Part of Your World' and suddenly The Penitent Magdalen appeared in her treasure collection. It is truly amazing the connections that can be made in this life when your eyes are open.